To say that Aïda is a staple of the Metropolitan Opera broadcasts would be an understatement. It was heard no less than thirty times between the inception of the weekly broadcasts in December 1931 and the closure of the old Met in April 1966. This was more than Tristan (28), Bohème (26), Carmen (26), Traviata (25) and Walküre (23). Verdi’s popular Egyptian love story has all the elements for grand opera: show-stopping arias for the soloists, intricate ensembles, and a major role for the chorus in the Triumphal scene. The cast for this Met broadcast was among the finest that could be assembled in 1953. Croatian Zinka Milanov was a Met favourite, making her debut in late 1937 and remaining until the old house closed in 1966. She dominated the core Italian repertoire especially in Il Trovatore, La Gioconda, Tosca, Otello and Pagliacci. This broadcast is the 5th of 7 she made as Aïda stretching between 1938 and 1955 and captures her at the height of her powers. She is able to elicit sympathy for Aïda’s plight while conquering the more dramatic aspects with ease. Mario Del Monaco’s Met career was far shorter than Milanov’s, but he brought an excitement to the Italian tenor roles that has rarely been matched since. Heard in only his second Met broadcast, he is an ideal Radames with a clarion voice able to cut through any competition from orchestra or chorus. Often criticised for his lack of nuance he certainly attempts in this broadcast to limit his instrument to suit the mood, particularly in the final scene. Making his Met broadcast debut is George London as Amonasro. London would go on to become a leading Wagnerian baritone and his large and tightly controlled voice is fully capable of dealing with all of Verdi’s demands. 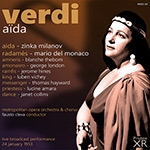 The present broadcast recording was very well captured and preserved from the matinée performance of 24th January 1953, the fourth of thirteen performances given by the Met of Aïda in the first half of 1953 (including four touring performances). The clear voices throughout are well complemented by rich and detailed orchestral playing, enhanced by this XR remastering, which includes a very small amount of convolution reverberation derived from one of the world's great opera houses to fill the Ambient Stereo field out ever so slightly.